At Migrant Action, we recognise the right, agency and desire that people have to participate in the life of their communities through volunteering. Volunteering is an instrument of solidarity and shared humanity. Migrant Action highly values immensely the diverse contribution volunteers make in every aspect of the organisation. Migrant Action is committed in supporting, enabling, celebrating and increasing opportunities for volunteering. Volunteers are welcomed to apply their creative and diverse skills, knowledge and experiences to enhance the organisation’s work. Volunteers constitute a vital strategic partnership between Migrant Action and local community playing a central role in service delivery, fundraising, networking, communications and overall success. 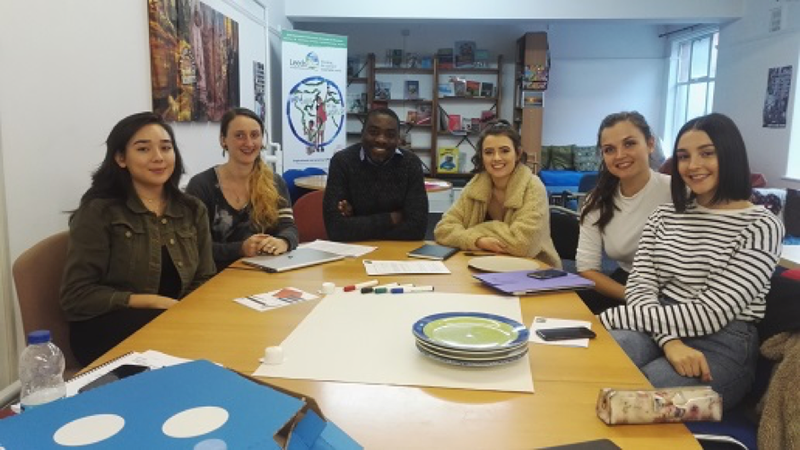 Following a review of Migrant Action’s communication strategy, our volunteers are helping to set out and implement a new proactive communications and fundraising strategy for the organisation. Migrant Action volunteers; Bailey, Megan, Lina, Celeste in strategy session with Julia (MA Trustee) & Fidelis. Also, Harriet joined a team of volunteers in helping vulnerable migrants in the refugee/migrant camp in Calais. 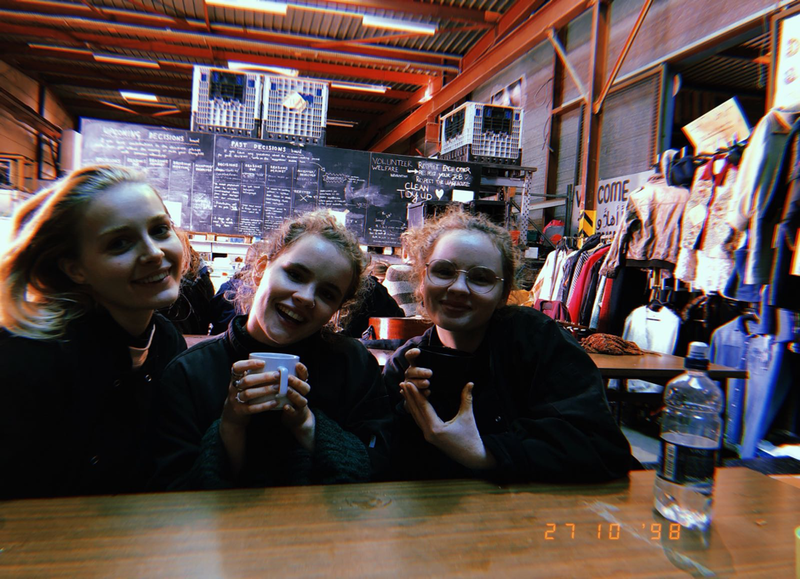 Harriet and the team spent 2 days in Calais working with Help Refugees to provide basic humanitarian assistance to the refugees and vulnerable migrants. Through volunteering within the organisation, in the community or abroad, our volunteers put in action the values, goals and vision of Migrant Action. We appreciate and celebrate the fantastic work of all our volunteers. Harriet and her team in the refugee/migrant camp in Calais. Listen to her inspirational podcast on our Facebook page linked below and support Migrant Action’s work. Migrant Action is an advocacy and rights based organisation. Our mission is to empower migrants and reduce vulnerability. Through our work we aim to advocate for vulnerable migrants and increase access to justice. We work to overcome the effects of government policies that create vulnerability amongst migrants. Migrant Action is committed to Migrant justice and integration. Since 2016, Migrant Action has been supporting new and vulnerable migrants (non-asylum seekers or refugees) including migrants with insecure and irregular immigration status in Leeds area. Visit our Facebook and website www.migrantaction.org for more information about our work. 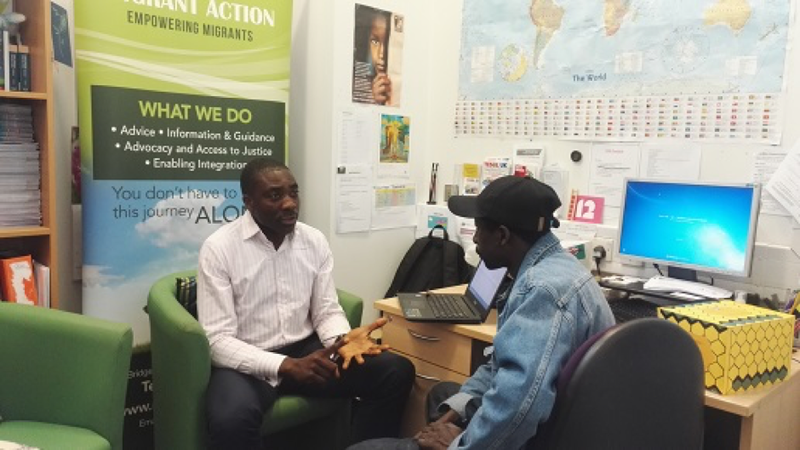 In April 2018, Migrant Action was made aware of the lack of appropriate service provision in Barnsley for other migrants who are not asylum seekers and refugees but who needed advice, guidance, advocacy and other forms of practical support. Migrant Action’s consultation with local partner agencies in Barnsley confirmed the gap in specialist service provision for other migrants who are not asylum seekers or refugees. Consequently, from May 2018, Migrant Action operates drop-in service in Barnsley every fortnight from 1-4pm at The CORE, County Way in Barnsley. We are excited about the prospects of this new service development. How can our work benefit local community? * Increase awareness and improve understanding and change attitudes. Our new service in Barnsley is an exciting service development opportunity working closely with other organisations and local community. On 6th April, Stuart Andrew MP for Pudsey, Horsforth & Aireborough met with the staff and management of RETAS and Migrant Action at RETAS offices in Leeds. Stuart was keen to understand the needs and experiences of asylum seekers, refugees and other migrants and how RETAS and Migrant Action are enabling and supporting people who access their services. The conversations with the MP captured the service model and interventions delivered by both services ranging from advice, education (ESOL), employment support, information and guidance, advocacy, facilitating integration, mentoring, access to legal advice etc. Both services provide a pathway for negotiating other forms of external support and assistance for refugees and other migrants. The discussions also highlighted the manifestations of the direct impact of government policies on different categories of migration and the implications for local service provision. It was a positive visit and the MP reassured staff and management of his passion for local community resilience and commitment to continue supporting the work of RETAS and Migrant Action in various ways at local and governmental level. In 2017, Migrant Action was selected to take part in a peer learning session organised by Paul Hamlyn Foundation. Facilitated by Esther Foreman CEO of Social Change agency, Fidelis joined the CEOs of PRAXIS, Migrant Resource Centre and Refugee and Migrant Centre. Themed around ‘Movement building for service delivery organisations’ the sessions focused on sustainability and leadership, Communications, Strategy, Service User Voice and advocacy, Service delivery and challenging power. The Peer learning session also involved an Action learning exercise whereby peers guided each other’s reflection and thinking on strategic organisational challenges and offered honest feedback and guidance. This was extremely useful shared learning from peers with lived experience and expertise. The learning gained from the sessions would be factored into our service delivery and service development plans. Through participating in the learning set, Migrant Action has built new links and is seeking to establish strategic partnerships with Migrant Resource Centre and PRAXIS both having extensive experience of working with other migrants including irregular migrants. Overall, it’s been an enriching and enabling exercise, very worthwhile.